Since Apple is doing a great job to provide PHP, Apache and MySQL straight out of the box, I'm not worrying about the Apache and MySQL. 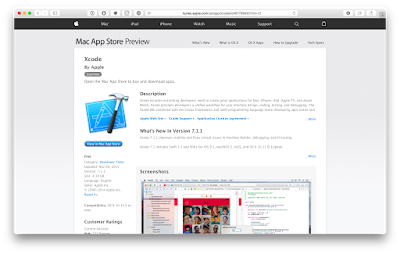 In order to to install PHP from source, you need to have XCode installed as it provides required libraries and headers that you will need to have a successful experience. Of course, get the latest and greatest PHP7.0.0 bundle straight from php.net. Don't forget to verify the signatures before you get started unpacking the sources. When you've unpacked the bundle (let's say its in /tmp) go into the directory /tmp/php-7.0.0. Here you will find your master command configure that you will need to set up your PHP installation. When you're requiring to know what options you can use, configure --help|less is your friend. For my own convenience, I've created a little tool that helps me to configure any version of PHP as it sets the bare minimum I need to achieve a running PHP platform. echo "  prefix    A prefix for your installation you would like to use"
echo "            e.g. 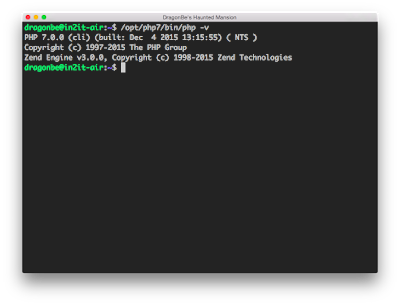 'php7', 'php56'"
I made this script (configure-php.sh) executable with chmod +x configure-php.sh. All that's required is to pick a great prefix (where you want php to be installed) and with ./configure-php.sh /opt/php7 you start configuring PHP. Once your process is completed (and you don't get errors), it's time to run make, make test and make install. Now it's time to check if we have a working PHP. Let's find out with /opt/php7/bin/php -v and you should be getting something like this. In a next article I will explain hot to add xdebug and have PHP7 run as an Apache module in the existing Mac OS environment. Until then.